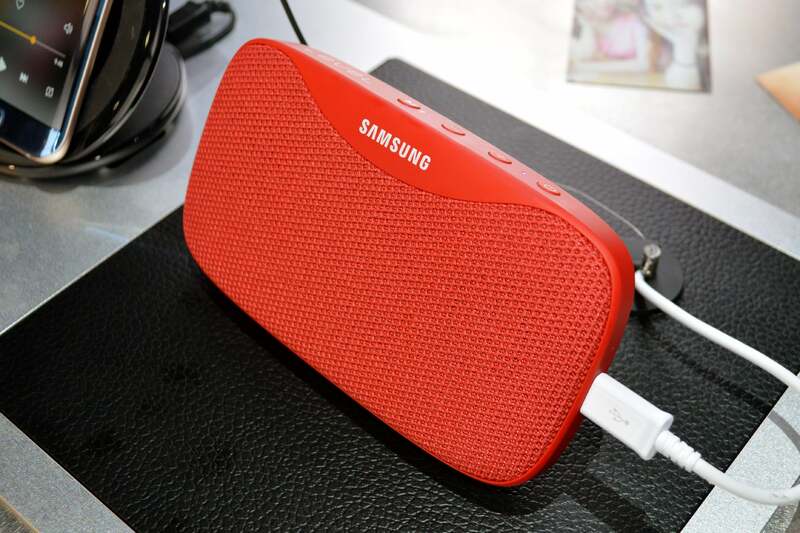 Portable Bluetooth speakers can be a tough sell; they’re just not “must-have’ accessories for most people. If you’re not wearing headphones, your phone’s internal speaker is probably fine—unless you’re having a party, or something. That’s why the Bluetooth speakers we saw on the CES floor this year are full of features you didn’t know you wanted: They’re waterproof and rugged, lightweight and portable, and full of flashing lights and colorful LEDs. Some have impressive battery life (50-plus hours), while others can sync up with a theoretically infinite number of other units for the ultimate surround-sound experience. You might not think you need a portable Bluetooth speaker in your accessory arsenal, but you could be wrong. Check out some of the awesome options that will be hitting store shelves this year. Monster’s newest pool party speaker is called the Battleship, and it’s as powerful (and mobile) as its name suggests. 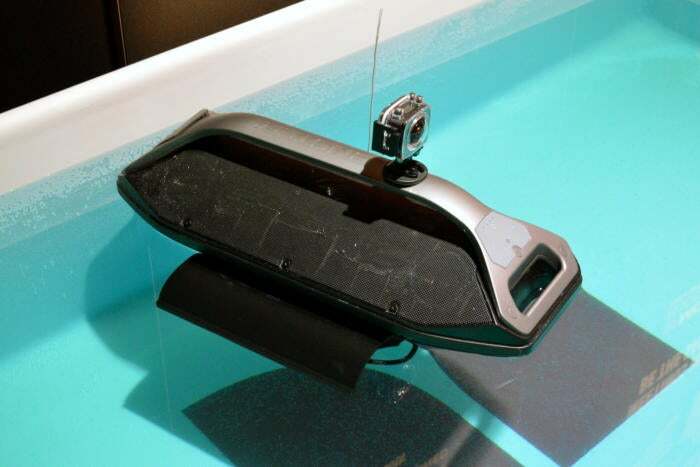 Imagine a remote-controlled floating behemoth of a Bluetooth speaker, with six internal speakers, omni-directional sound, and 25 hours of battery life, and you’ve got the new Battleship. This speaker is waterproof, of course, and it’s got a propeller that you can control from an app to move it forward, backward, left, and right. If you feel like purchasing multiple Battleships (or other speakers from Monster’s Blaster lineup), you’ll be able to sync the speakers up to play the same music from a single source using the Battleship’s “Big Party Mode.” The Battleship will start shipping in the fourth quarter of 2017, and will cost $600. 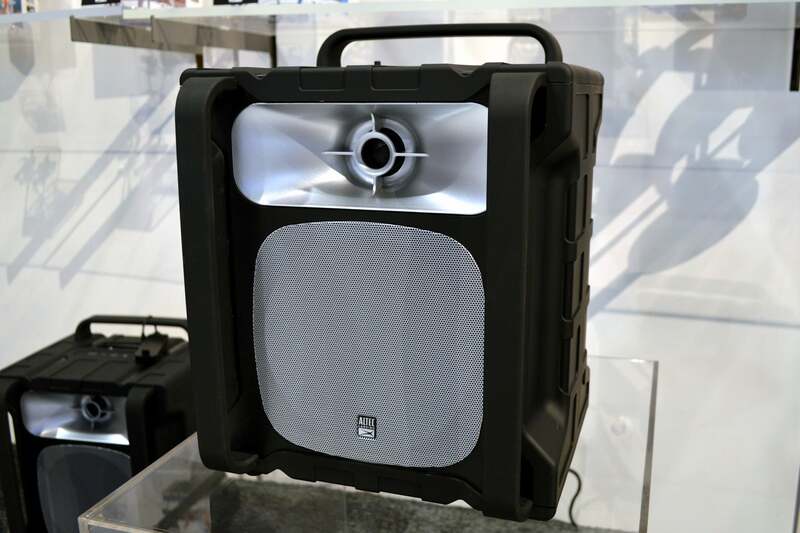 Altec Lansing’s new Sonic Boom is the speaker that does it all. This “everything proof” speaker is waterproof, dust-proof, shock-proof, snow-proof, and it floats—despite its size. This huge speaker packs a high-quality subwoofer, plus a midrange and a tweeter so you won’t lose any detail or fullness in your music. On top of that, the Sonic Boom boasts other impressive specs: 50 hours of battery life and the ability to connect to up to 50 other Bluetooth speakers in “House Party” mode. You might not be able to send it into a pool battle with the Monster Battleship, but the Sonic Boom is also nicely priced—it’ll cost just $250 when it hits stores this fall. Sony’s SRS-XB40 speakers are here to take your house party up a notch. These small, portable water-resistant Bluetooth speakers have a ton of built-in customizable flashing lights—multi-colored LEDs, a flashing strobe, and speaker lights that light up the individual speakers inside the unit—for a rave-like experience. The SRS-XB40 also has an “Extra Bass” button that you can press to get punchier, more intense bass, so it really is made for the EDM lifestyle. With Sony’s “Wireless Party Chain” mode, you can pair up to 10 of the SRS-XB-series speakers (their lights will also sync up), or you can just pair a couple of the speakers for stereo sound. There’s no word on pricing yet, but a Sony rep says the entire line of SRS-XB speakers (SRS-XB10, SRS-XB20, SRS-XB30, and SRS-XB40) will probably be between $50 and $200 when they start shipping in mid-March. The new JBL Pulse 3 is bigger than its predecessor (the JBL Pulse 2), but it’s also more attractive. 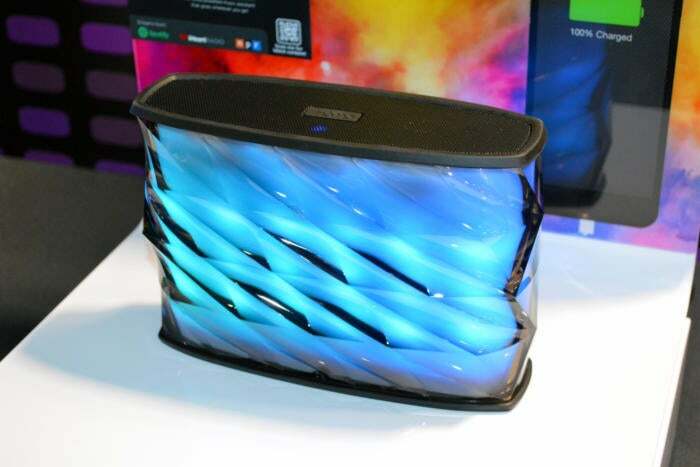 This portable Bluetooth speaker now features a dedicated customizable light show up top and three speakers around the base for 360-degree omnidirectional sound. The Pulse 3 doesn’t skimp on power or quality—the speaker is loud despite its portable size and offers excellent audio clarity. The Pulse 3 is water resistant and works with JBL’s Connect+ app, which lets you link a ton of speakers—more than 100, if you feel so inclined—for a synched-up audio-visual experience. The Pulse 3 will retail for $199 when it starts shipping this spring. If you’re looking for a portable Bluetooth speaker that will also look fabulous in your ultra-modern living room, Crazybaby’s Luna is worth checking out. 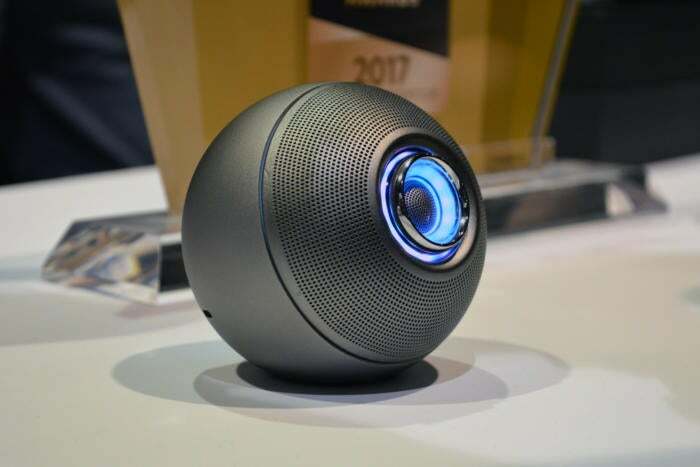 This small, futuristic-looking orb weighs less than a pound, has eight hours of battery life, and makes a perfect travel companion or part of a multi-room home audio system. The Luna has built-in Bluetooth and Wi-Fi, which means you can connect up to 32 units in different rooms. The speaker is more powerful than it looks: It’s got an independent one-inch tweeter that telescopes out, in addition to a full-range driver, for multi-layered audio that you wouldn’t normally get in such a small package. The Luna will cost $199 per unit (with possible discounts for multiple devices) when it starts shipping in approximately three months. Lemon Technology’s new California Roll is clearly designed with the beach-hopping surfer in mind. The California Roll is portable but powerful—it’s got six speakers inside its rugged, waterproof body—and comes in a variety of colors (black, blue, red, silver, and white) and two grill finishes (cloth and metal). The back of the speaker is also covered in 33 solar cells to power the speaker’s internal battery (which can also be used to charge your tech via USB ports)—seven hours of sunlight will give you one full charge, or 20 hours of playback time. 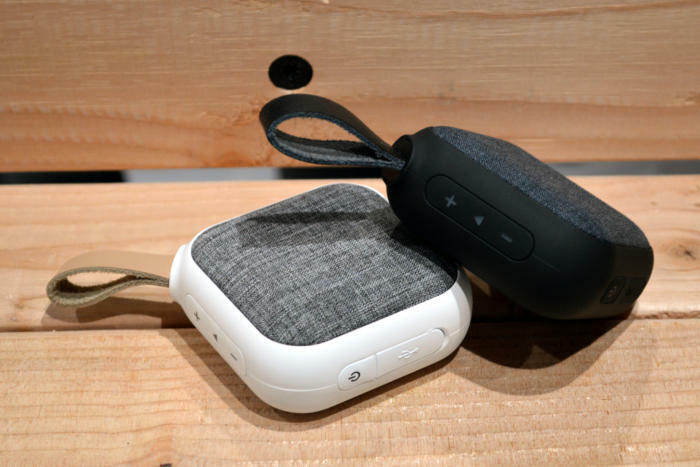 The California Roll has built-in Bluetooth (multi-connection—it can be connected to three phone simultaneously), NFC, and a microphone for calls and voice control. Individual speakers can also be paired up for a stereo experience. 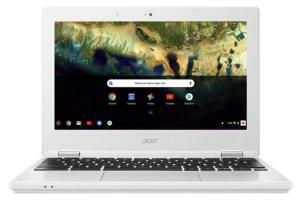 The California Roll is available pre-order now for $249, with a March delivery date. Basically everything is at least water resistant these days, but most of the “rugged” Bluetooth speakers we’ve seen have a distinct, sporty design. 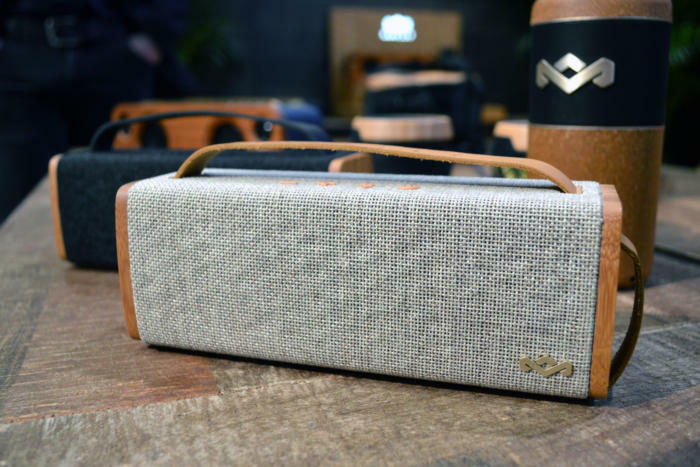 The MVMT S4 is a tiny water-resistant Bluetooth speaker that features a less obviously rugged aesthetic -- it’s made of cloth and leather and soft-touch rubber, instead of brightly-colored plastic. This lifestyle speaker is the perfect size for tossing in your bag (it’s about the size of a couple of decks of cards), and you don’t have to worry about it if you get caught in a rainstorm. There’s no word on pricing, but the MVMT S4 (and the whole MVMT line) will start shipping in April of this year. 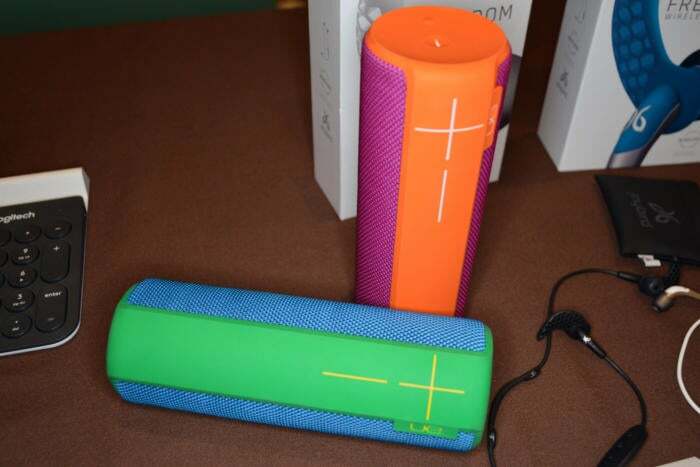 If bright colors are your thing, the UE Boom 2 will definitely catch your eye. The UE Boom 2 comes in a variety of super-fun color combinations, like “tropical” (orange and purple), “cherrybomb” (red, pink, and blue), and “greenmachine” (green, bright turquoise, and yellow). As you might expect, based on its bright colors and rugged-feeling exterior, the Boom 2 is waterproof, with an IPX7-certification (it can be submerged in up to three feet of water for 30 minutes). The Boom 2 looks like some of the other cylindrical Bluetooth speakers on the market, but it’s smaller and slimmer than most -- it weighs about 1.2 pounds and is just a little larger than a large energy drink can. The Boom 2 has 15 hours of battery life, a built-in microphone and speakerphone capabilities, and is currently available for $199 (you can read our review here). 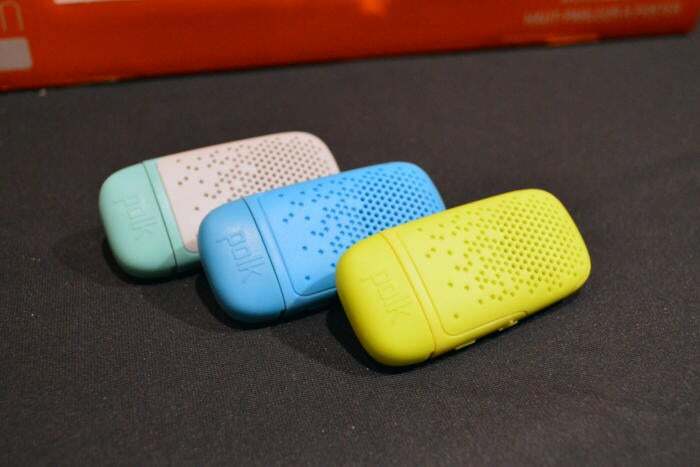 According to Polk, the Boom Bit is the world’s first “truly wearable” Bluetooth speaker. And they might be right. This tiny Bluetooth speaker weighs about 8 ounces, measures less than 3 inches long, and has a built-in spring-steel clip so you can clip it onto your shirt collar (or, I guess, just about anywhere else). The Boom Bit isn’t the most powerful speaker, and it’s not supposed to be. Polk imagines this device will function as more of a headphone replacement rather than an actual speaker—it lets runners, cyclists, and other active, outdoorsy-types listen to music while maintaining awareness of their surroundings. The Boom Bit is available now for a totally affordable $30. It comes in black, blue, lava red, mint gray, and volt yellow. 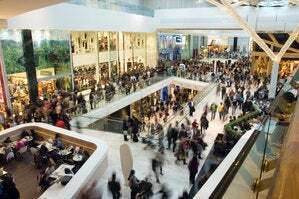 Muzen is a Chinese company that’s launching in the U.S. this year. 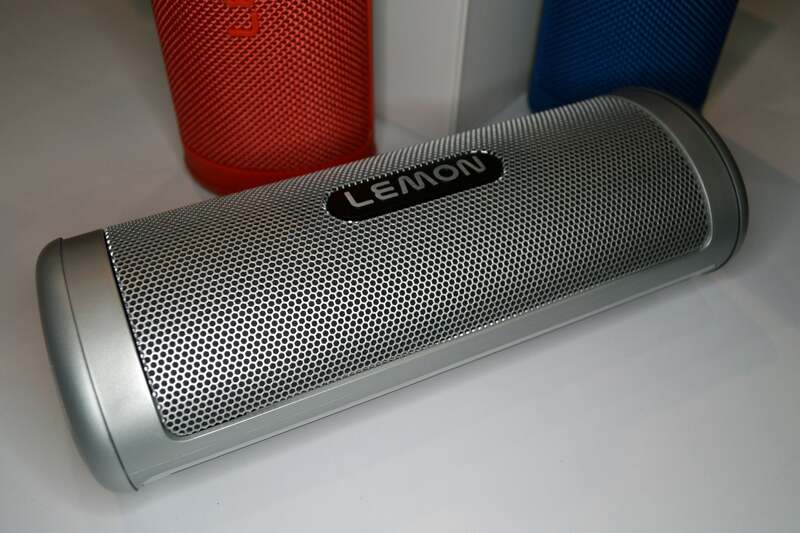 Its flagship product is a tube-amplified AM/FM radio/Bluetooth speaker, but the company also has some portable options, namely the Muzen OTR (which stands for “On The Road”). The Muzen OTR is a petite vintage-styled FM radio and Bluetooth speaker, and it comes in two versions, wood and metal. 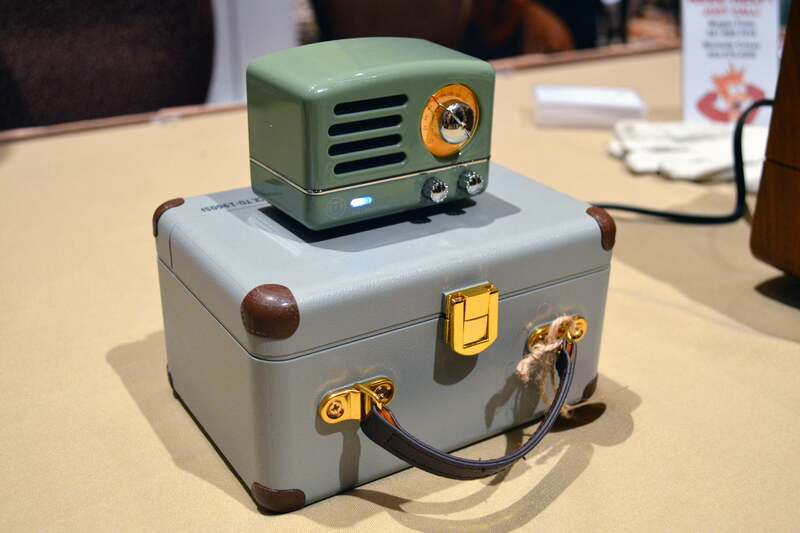 The old-fashioned look of this speaker might not be for everyone, but it’s definitely well-made. The wood version is handcrafted and the metal version comes with a cute vintage luggage carrying case (the wood version comes with a leather carrying pouch). The speaker has about 10 hours of battery life and both versions will cost $100 when they launch in the U.S. in the second quarter of this year. Samsung’s new Level Box Slim is the perfect smartphone companion. This tiny water-resistant Bluetooth speaker packs 30 hours of battery life and a 2600mAh battery for charging your phone on the go. It’s super small (about the size of your Samsung Galaxy S7), and it has a little built-in kickstand for easy setup. There’s no word on when the Level Box Slim will hit shelves (well, according to company reps, “sometime this year”) or how much it will cost, but with 30 hours of battery life, built-in NFC for easy pairing, and the ability to pair two units together for stereo sound, it’s definitely appealing. House of Marley’s products always feature a unique, eco-friendly but premium design, and the Riddim BT is no exception. This small, portable Bluetooth speaker is made of the company’s sustainable REWIND and REGRIND materials, with bamboo sides and a soft removable leather carrying strap. The Riddim BT is small—perfect for toting around—but powerful, with two active drivers, 10 hours of battery life, and a built-in microphone for speakerphone calls and voice activation. The speaker can be paired with other HoM speakers for a more immersive audio experience. The Riddim BT costs $130 and comes in black and “natural” finishes, and is available now. The iHome iBT84 is a colorful, lightshow-style speaker that doesn’t look explicitly like a speaker. The iBT84 is housed in a durable, splash-proof, wave-textured plastic cabinet, and has no visible grill, though it definitely produces some great audio. 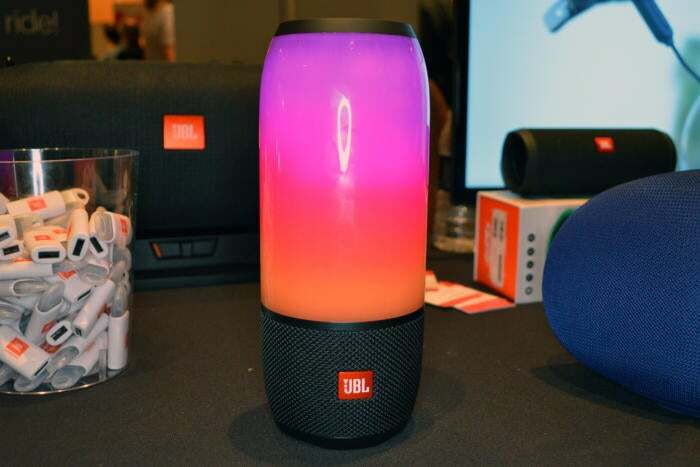 This speaker has color-changing LEDs, but it’s not quite as flashy (though, okay, it’s still pretty flashy) as JBL’s Pulse 3 or Sony’s SRS-XB40. There are six color modes, but they focus more on waves and pulses of lights rather than bright flashes or strobes (there is an EQ mode that pulses the light to the music). The iBT84 offers 10 hours of battery life, speakerphone capabilities with digital echo canceling, and a USB port for charging your phone and other mobile devices. The iBT84 is available now for $70. 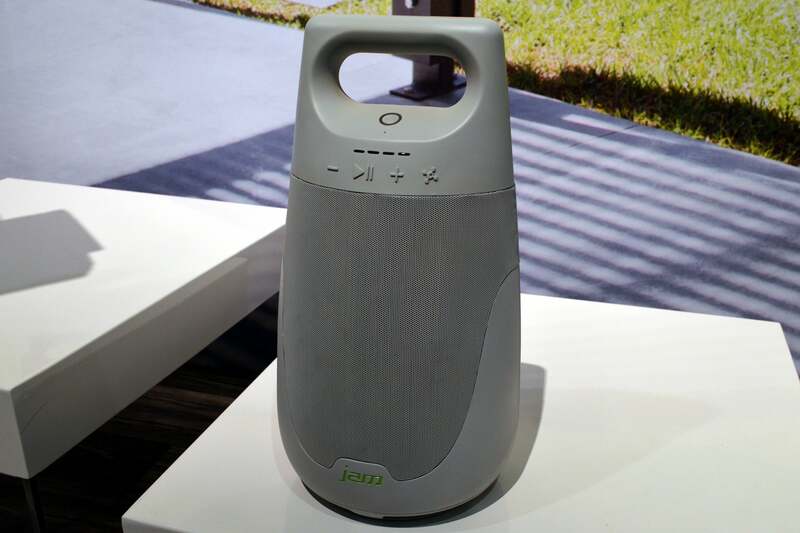 JAM Audio’s Session speaker is big—it weighs five and a half pounds—but it’s also durable (dust- and splash-proof), and it features Amazon’s Alexa voice services technology. The Session is designed for both indoor and outdoor use, and its teardrop casing houses three speakers for omni-directional sound. The speaker has both Bluetooth and Wi-Fi, offers up to eight hours of battery life, and will be compatible with JAM’s free Wi-Fi app, which lets you control multiple speakers at once. 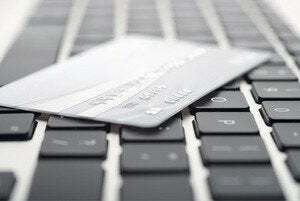 The Session will cost $249 when it starts shipping this fall. 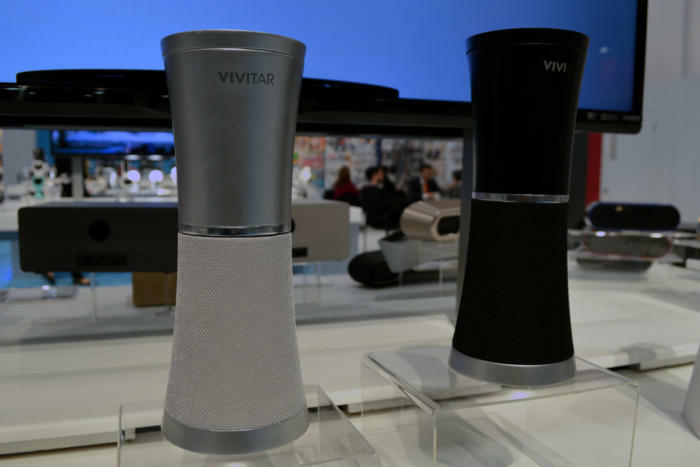 Vivitar’s new Vivi Voice Assistant is a Bluetooth speaker and a voice-controlled assistant that integrates with both Amazon’s Alexa technology and smart home products (including, of course, Vivitar’s own smart home products). The Vivi Voice Assistant is a lot like Amazon Echo—you don’t need to touch it to interact with it, you can simply talk to it to wake it up and it will be able to do things like tell you the weather, play music, and read the headlines. The speaker itself offers 360-degree omni-directional sound and will cost $99 when it starts shipping in Q2 2017, so it’s significantly cheaper than the Amazon Echo.